NEW YORK (AP) — One-quarter of the way through the schedule, minus the Panthers and Redskins who had byes in Week 4, there’s one obvious trend in the NFL: Nobody knows anything. Still, we’ll try to decipher what happened in a September that saw some early season swoons and some sizzling starts. The NFL wants offense, offense and more offense. If a game winds up 60-55, the folks on Park Avenue will have no problem with it. So the points explosion the Rams and Chiefs put forth in the first four games deserve praise for their entertainment value, and perhaps for pleasing the upper echelon bosses of the league. Both teams have young, strong-armed gamblers at quarterback, dynamic running backs, and schemes that befuddle defenses. —Cincinnati . Although the defense hasn’t quite come around, the Bengals (3-1) have displayed enough with the ball, averaging 31.5 points despite playing three road games. There’s a resilience this club rarely has displayed in recent seasons, best exhibited by the way the Bengals rallied to win at Atlanta on Sunday. —Baltimore . 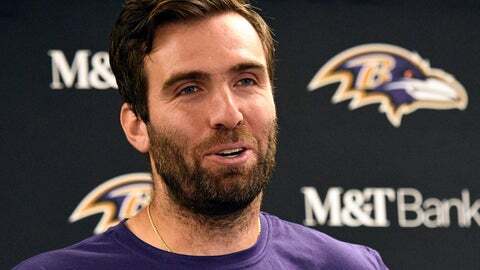 And most notably, Joe Flacco, who with a new and much stronger receiving group, has looked like the guy who helped the Ravens (3-1) win the 2012 championship. Almost always possessing a reliable defense, Baltimore has yielded 65 points; only Jacksonville among clubs that have played four times has yielded fewer. —Tennessee . Talk about resilience, the Titans (3-1) have won three straight, each by three points. The gumption they showed in overtime versus defending Super Bowl champ Philadelphia — converting three fourth-down plays in overtime, one via penalty — is a great sign in Music City. —Chicago . Monsters of the Midway indeed. It’s been a while since a trade just before the season kicked off has had the kind of impact of the Bears (3-1) getting Khalil Mack from Oakland. This is a defense that should keep Chicago in every game — don’t go overboard, Bears fans, by Mitchell Trubisky’s six touchdown passes against a befuddled and, at times disinterested group of Buccaneers — and that bodes well for winter time for a recently downtrodden team. —Cleveland. Hey, the Browns (1-2-1) have a win already. And a tie. —TV ratings. They are up and, as we get closer to cold and nasty weather, the numbers figure to continue climbing. Let’s start with the new head coaches, who have a combined mark of 10-18, including Arizona, the only winless team at 0-4. Steve Wilks has a defensive background, but the Cardinals have allowed 94 points while scoring a measly 37. Already, 13 teams have scored at least 37 points in a game. You must score consistently to win in the current NFL. Chicago’s Matt Nagy and Tennessee’s Mike Vrabel (see above) each are 3-1. Indianapolis’ Frank Reich, Oakland’s Jon Gruden, Detroit’s Matt Patricia and the Giants’ Pat Shurmur all are 1-3. —10-minute OTs. The 2017 rule change had no effect as there were no ties. Already we’ve had two this season, nearly had three more on Sunday, and a perhaps unintended consequence of the shortening of overtime from 15 minutes, generally for player safety, could be coming. The OT structure allows the team that kicks off to begin the extra session to get the ball if the opponent opens with a field goal. What if that opponent uses up all 10 minutes and kicks a three-pointer to win it as overtime expires? —The malaise plaguing supposed Super Bowl contenders in Minnesota, Pittsburgh and Atlanta, all playing far below expectations and revealing some alarming weak spots. Le’Veon Bell’s holdout and what it has done to the Steelers, on the field and in the locker room, has gotten ugly. Injuries to such key players as Earl Thomas, Tyler Eifert, Jimmy Garoppolo and three Falcons defensive starters not only were tough to watch, but could have long-range impacts on their careers and their teams’ chances. Coaches grit their teeth or, in the case of Packers’ Mike McCarthy, slam their play sheet to the ground. Players demonstratively protest calls and reversals of calls. Broadcasters, including former NFL officiating chiefs, wonder aloud where that decision came from and how it was reached. Owners probably throw food around in their luxury boxes. Points of emphasis become so emphasized that they exceed their intent. Hey, a Miami Dolphin gets hurt trying to avoid landing too hard on a quarterback in fear of getting a penalty for something that physics say is unavoidable. Video replay in September became more intrusive than ever, and perhaps even a bit unreliable. Of course, there are three more months to go. Let’s see what October brings.